Nick Jonas at Live in the Vineyard in Napa Valley, California. It has only been less than a week since the Jonas Brothers confirmed the rumors of their break up with People Magazine and ABC’s Good Morning America, but Nick Jonas is back to playing music again! E! News has reported that Nick performed his first solo show since the break up Sunday night (November 3rd) at an intimate show at Live in the Vineyard in Napa Valley, California. To get an idea of what to expect from Nick Jonas as a solo artist, all you have to do is be reminded that he released the album, Who I Am in January of 2010 as part of his side project, Nick Jonas And The Administration. 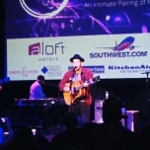 The album was a dramatic musical departure from the Jonas Brothers’ “Pop/Punk” production style, sounding more like a gumbo of Blues, Rock, and Blue Eyed Soul. For more details on The Jonas Brothers’ break up, and a look back at all they have accomplished head over to Clizbeats.com! !